I have been loving my local library lately; I think I have been there every week since we moved to Omaha. On one of my more recent trips I picked up Down Home Wholesome by Danella Carter. This cookbook is filled with 300 low-fat recipes. Danella includes little stories with some of the recipes, and with her yeast roll recipe the story said these were her mom’s yeast rolls and whenever they were invited someplace for dinner her mother’s rolls were always requested. Since these rolls were infamous, I had to try them. They were delicious! 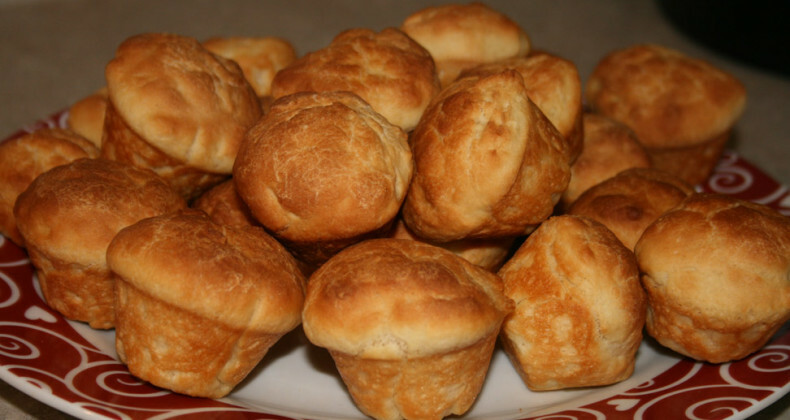 I even made some mini yeast rolls for my girls to enjoy. Dissolve the yeast and honey in the warm water and set aside for 10 min. Scald the milk in a small saucepan. Add the butter, sugar, and salt, and let the mixture come to room temperature in a large mixing bowl. Add the yeast mixture. Add flour, a little at a time, until a soft dough is formed. Turn the dough onto a lightly floured board and knead until smooth, about 12 min. Shape the dough into a ball and place in a large buttered mixing bowl. Butter two muffin pans. Punch down the dough with your fist, and knead for 3 minutes. Pinch off 24 pieces about 2 inches in diameter. Place each piece into a muffin cup. Cover and let sit for 45 minutes, or until rolls have doubled in size. Preheat the oven to 425 degrees F. Oil the top of each roll. Bake for 15 minutes, or until tops are golden brown.